Stephen, myself and my two offspring made the trip to Newark to the Hammerhead show. I visited this show when if frst replaced the old Fantasy Partizan at Kelham Hall, but I hadn't been since the first one, so this was my first trip to the new venue at the Newark showground. It was quite a jolly little show and I bumped in to a few familiar faces. 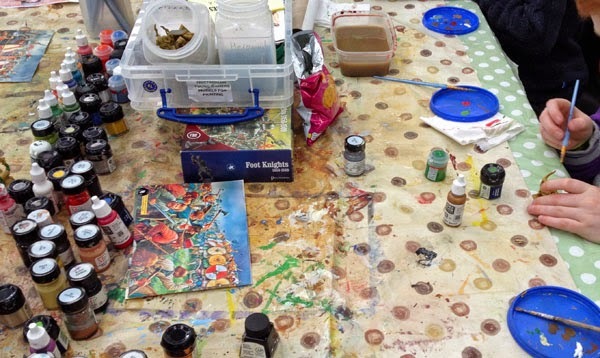 The small boys had fun and played in several games (they're all participation at Hammerhead) and did some painting. Perhaps beacuse of the participation stricture there weren't rally any "showstopper" style demo games and eye candy, but then that's not what they're looking for. One minor criticism would be that this is a show targetted at younger gamers I'd have said, with the aim of getting them to join in. However several of the games were all quite long-winded affairs with some complex rules. Had it been me I'd have been looking to run a couple of 20 minute games each hour, rather than (as one gamer did) setting the timer for an hour (!) at the start. 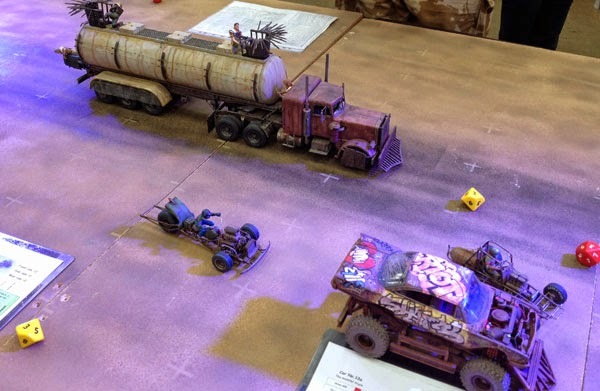 The boys had fun playing this Mad Max inspired game. 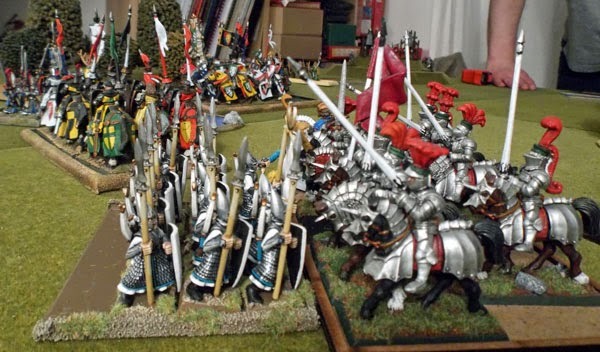 Chum James' El Cid collection doing Lion Rampant duty. 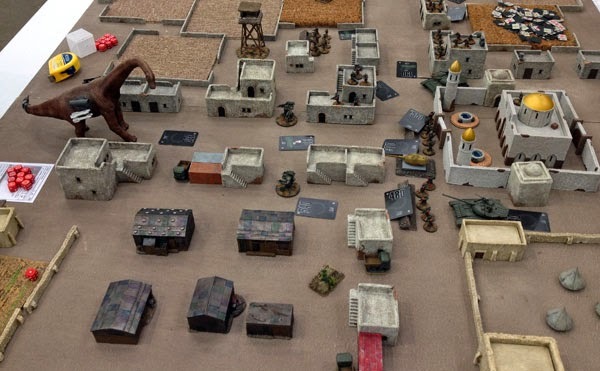 Dinosaurs versus Gruntz - the boys loved this one. 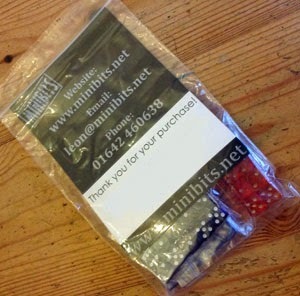 I also picked up some loot. Late Roman army to fight my Saxons. 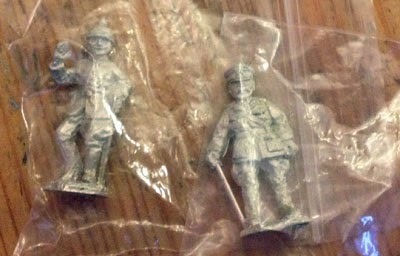 And I got a couple of freebies - one each of the show's WW1 models. The German will be for Scrivs, should he want it. 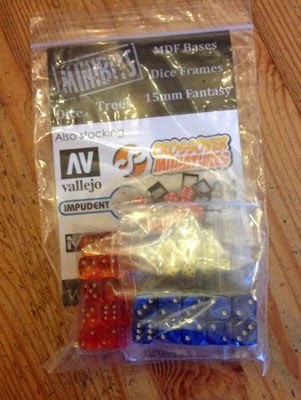 This week I was supposed to play two games of Warhammer. 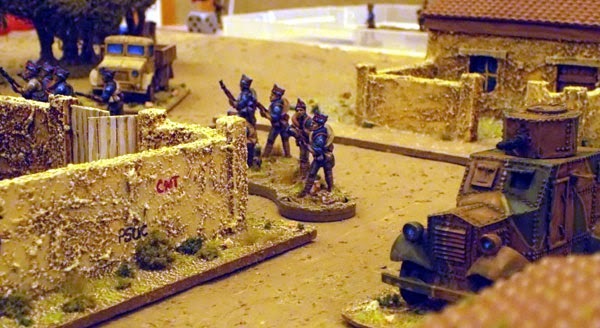 In the event, changes to the Dad's Taxi schedule meant I didn't play either game (apologies, General Ballroom) but as one door closes, another opens and instead I managed to inveigle myself into a game of Chain of Command with Scrivs, James and Northstar Nick. 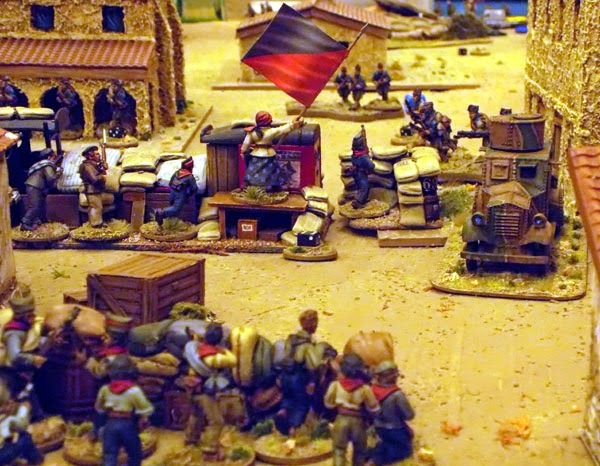 Specifically a Spanish Civil War version of the game. 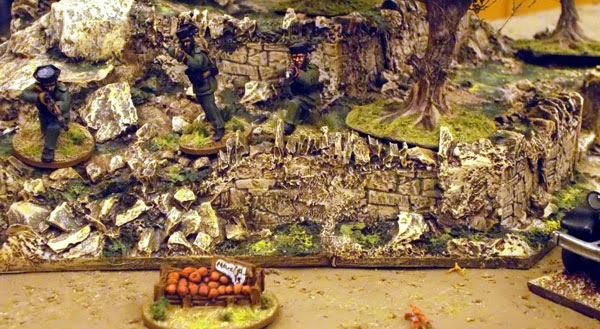 Scrivs and Nick had provided all the terrain and figures, and it all looked absolutely splendid. 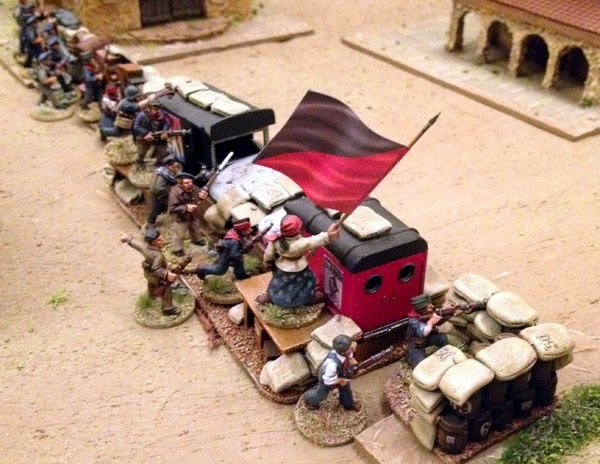 I refused to play the fascists, and so was given some of the forces of La Republic to command. 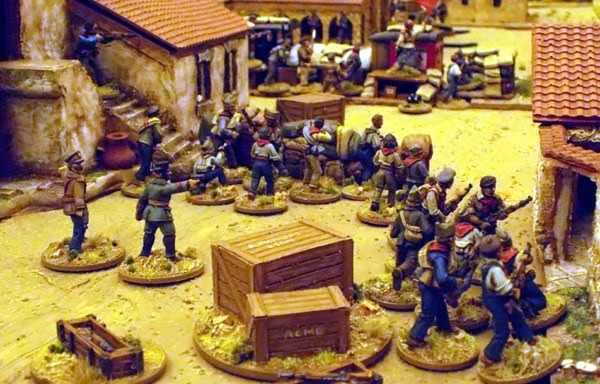 I checked with El Nick what to do and he instructed me to "Man the Barricades!" so I did. The Table in all it's glory. 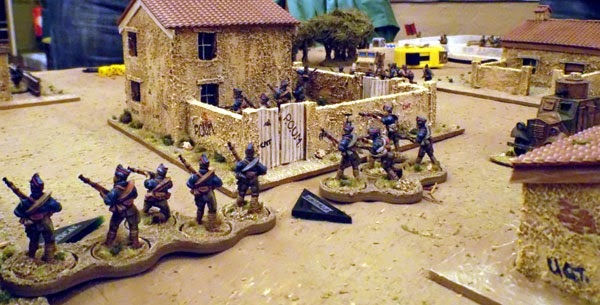 Man (or woman) the barricades. 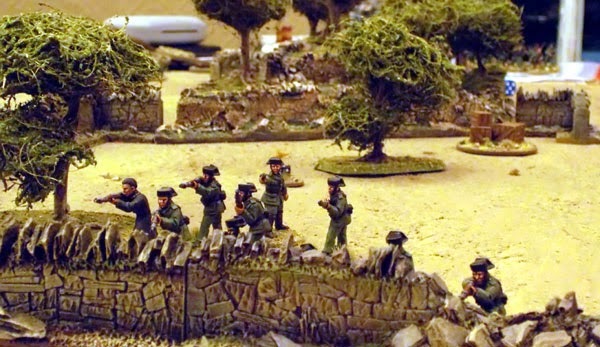 Into the orange grove, men! More Republicans bolster the cause! 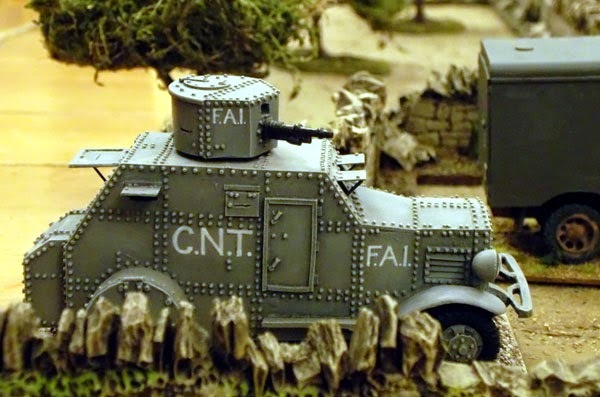 The Fascist armoured car breaks through but the banners still wave. My apologies for the yellow "cast" to some of the pictures. Lighting at the White Hart leaves a fair bit to be desired. In the event we didn't finish the game, mainly because we were chatting and not focused and Scrivs had to explain everything to me in words of one syllable. But a great time was had by all. 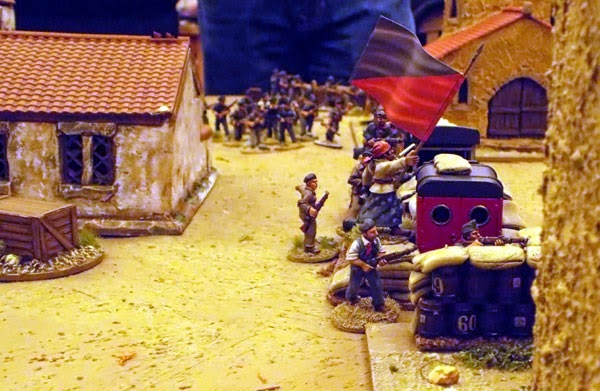 Nick's men drove off James' fascists in a hail of bullets, but the police I was facing managed to flank me through the orange grove before driving their advantage home with the armoured car. Turned out I needn't have been. 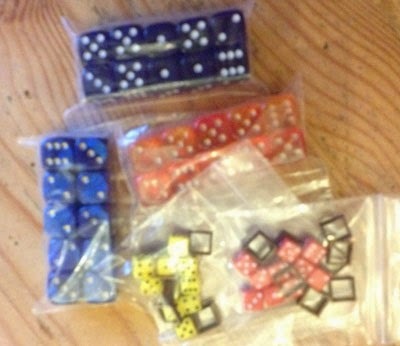 The game flowed very well and I got a handle of the basics pretty quickly. It all seemed to make sense and the nice "multiple six" mechanics that break the IGO-UGO flow worked nicely I thought to create those moments when suddenly one side or another flows forward unexpectedly to seize the initiative. 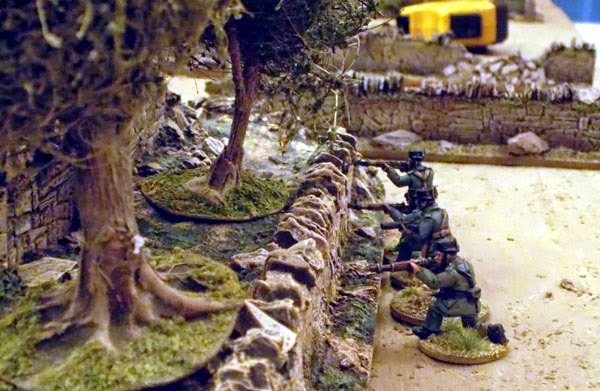 James an I talked about Americans versus Fallschirmjager, I started thinking about buying an International Brigades force from Nick and I even texted Stephen during the game, thinking we might revive our abandoned Bolt Action project from a couple of years ago as a new Chain of Command project. 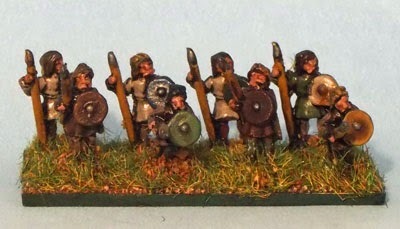 Finished the Pendraken 10mm Saxon Noble Warband for my Dux Bellorum armies. 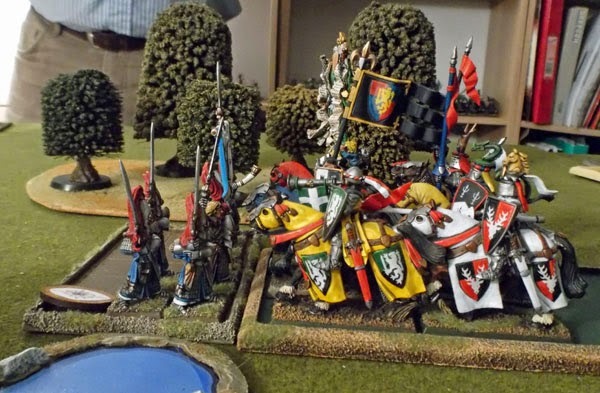 You can tell these are noble because they've got flags and fancy shields and that. 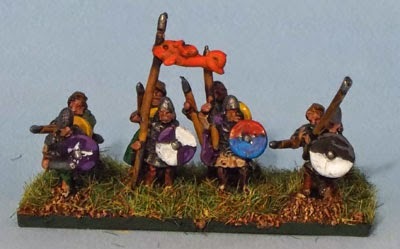 Unlike these ordinary warband I painted some time ago. 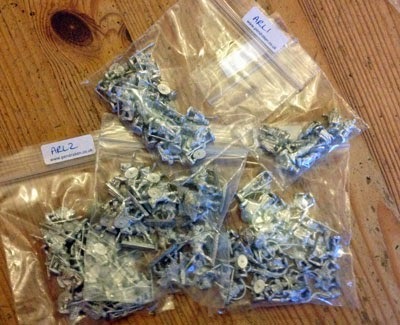 Three stands, though I doubt I'll ever use that many in a game of Dux Bellorum. 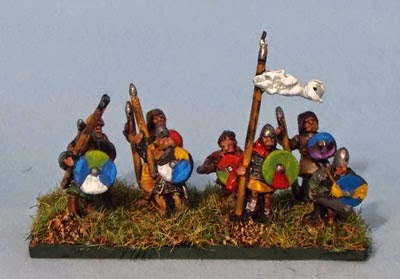 However if I use them as command for the spearmen I've already painted that gives me three units for the Warmaster army I'm never going to finish for a whopping 150 points! If it ever stops raining today I'll get the command models painted and then the army is finished and I'll do some army shots. 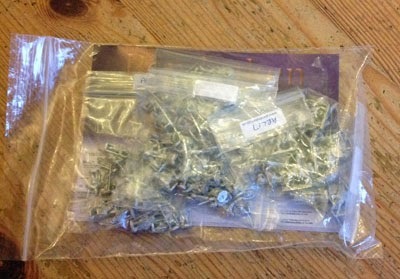 I have flitted to my 10mm Saxons. Here are some of them on painting sticks. They still need some work on the shields and 'taches but should get them finished this evening - swimming and scouting runs permitting. They're actually Anglo Saxons, so intended for the later period, but at this scale I'm not going to be too worried. I originally bought these many moons ago to play Warmaster ancients but ran out of enthusiasm and didn't have an opponent. 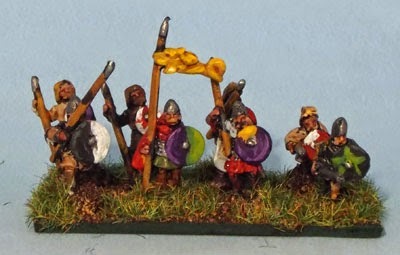 But these three plus the spears and bows I've painted previously mean only need to do a command stand and I'll have a useable Dux Bellorum Saxon force. 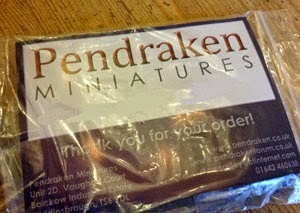 So I've ordered a few Late Romans to collect at Hammerhead this weekend. Thick mist rolled around the small group of horsemen. Only the jangling of tack and chirrups of thrushes feasting on nearby quimberry bushes disturbed the silence. Abelard von Gesgnet turned to the figure on the horse next to him - the youngest son of the Elector of Wissenland. "Cold, dank and wet" he murmured to the young man "just like your mum's..."
"My Lord!" interjected a nearby functionary "over there" the frantic man pointed. The mist was beginning to lift and the Empire soldiers could just make out shapes forming over to the left of their positions. 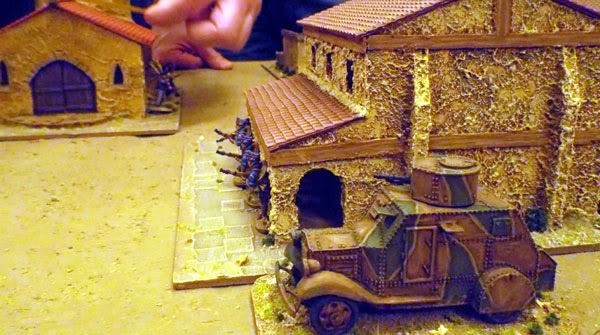 Lithe figures hefting large weapons and a chariot pulled by large cats. 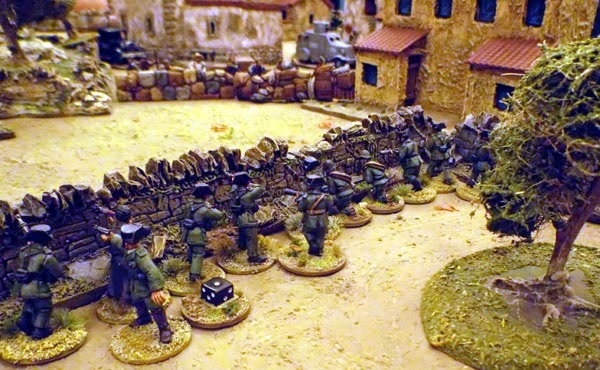 "There's the dress wearers" von Gesegnet spat "now where are the snail munchers?" 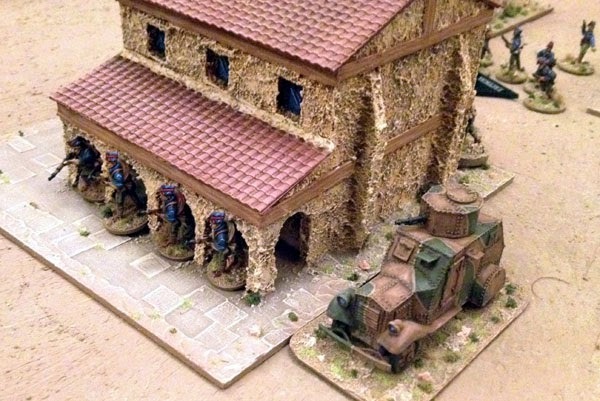 And so, once more to the Ilko Gaming Hut for fine wine, convivial company and the small matter of a game of Warhammer. 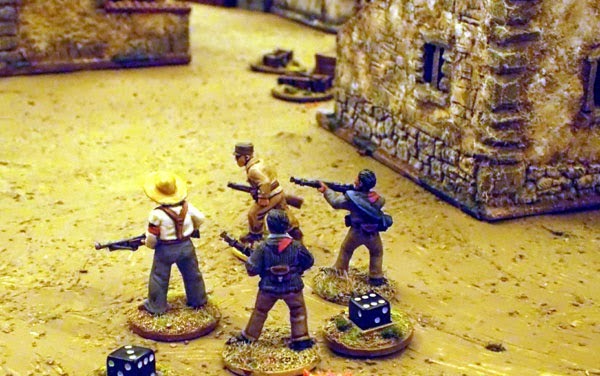 Once General Ballroom had had a go at reading the T&T rules a few times in a variety of voices, Stephen took charge and we rolled for deployment. I (as is traditional in T&T games) found myself in the centre position - vulnerable to attack from both sides. 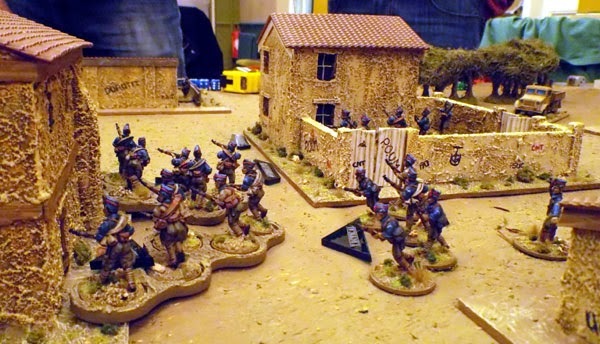 As a result I deployed quite far back whilst the other two armies pushed forward more aggressively. We then each placed and scattered an objective, one of the mystical magic items to be found on this part of the island. Oooh, come on girls, lets scratch their eyes out! I went first and, terrified by the advancing elite elves stayed put, declared the Elves my enemy in every phase and did my best to magic and shoot them. 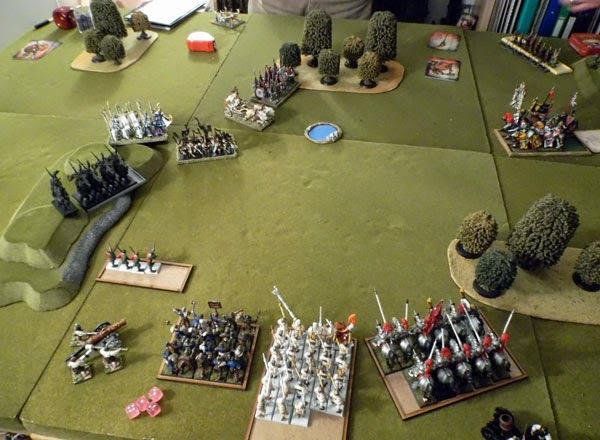 However a well played card by General Ballroom commanding the Elves meant I actually had to shoot the Bretonnians, killing a couple of knights, but leaving the elves unscathed. 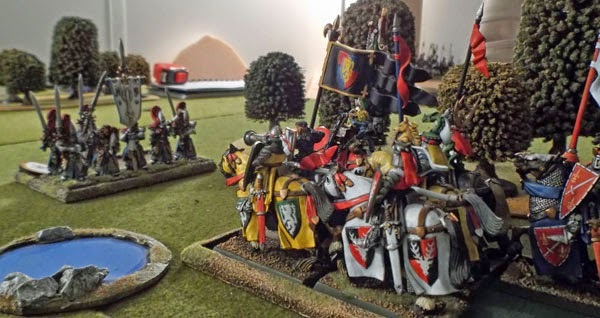 In return the elves first captured one of the magical objectives (the Cloak of Ulric no less) before unleashing a storm of magic and shooting at the Empire, mainly aimed at my poor handgunners who to my amazement held their ground. The Bretonnians meanwhile sneaked toward my right flank and seized another objective (their own Silver Mirror) before dropping a large rock on the heads of the White Lions, taking a rank or more away. 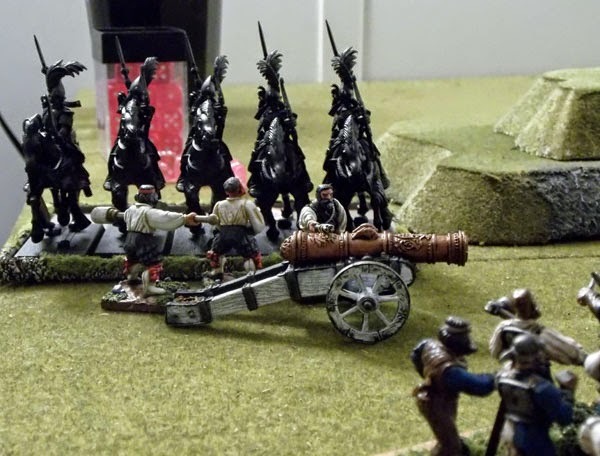 In my next phase I tweaked my deployment slightly to better meet the onrushing elves and prepared to unleash a storm of artillery. In the magic phase the bright wizard as in the previous game rolled a miscast, but with less dramatic results, simply ending the magic phase. 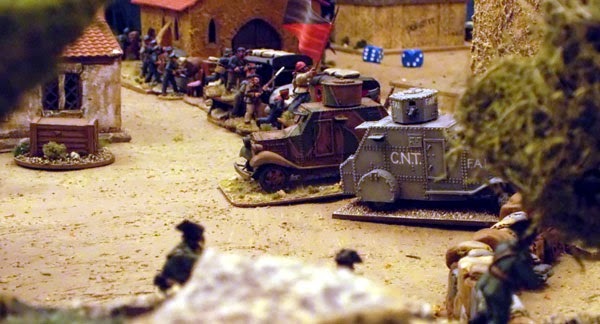 I rolled for the cannon three times, re-rolling each as the dice ended up cocked, before finally getting a misfire at the fourth attempt. 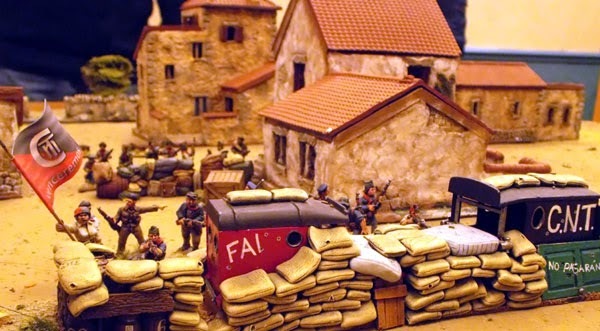 The mortar then misfired as well. The early morning mist had clearly dampened the powder (it happens to all of us). 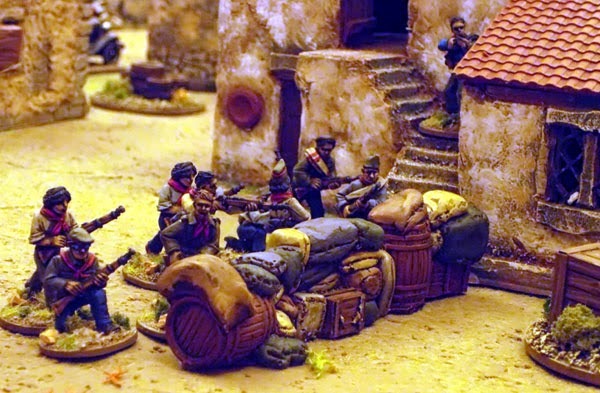 The handgunners managed to kill a pair of Ellyrian reavers, but they passed their panic test with ease. 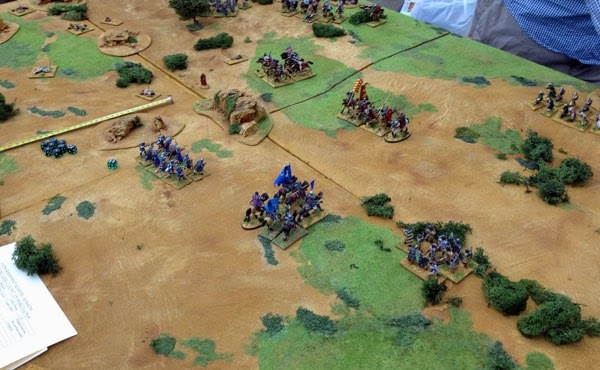 Much to my relief the Bretonnians, happy with their magical prize abandoned their advance on my flank and headed toward the elves in the centre. 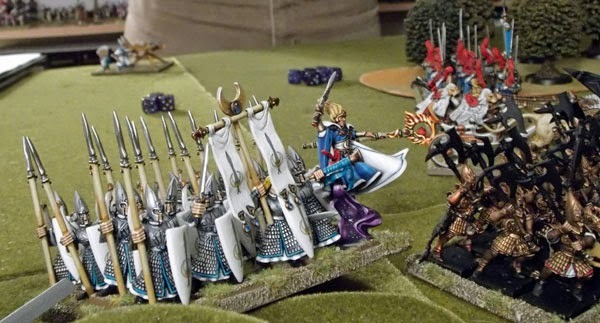 Misfiring and inaccuracy meant the trebuchets took no toll on the elves and a magical miscast put paid to much threat from the Life sorceress. The elves once more decide to pick on my poor harmless Empire force and declared charges along the line. 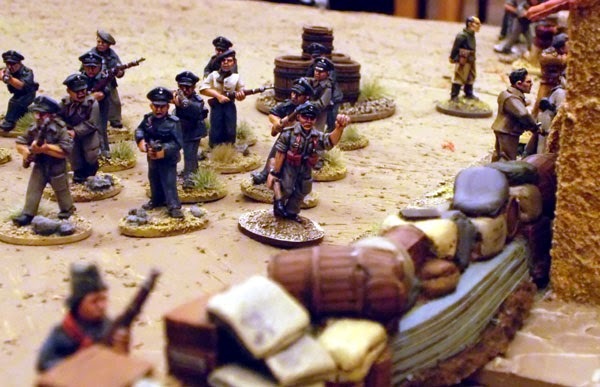 Some foppish shooting took out a few of the militia, but they held firm. 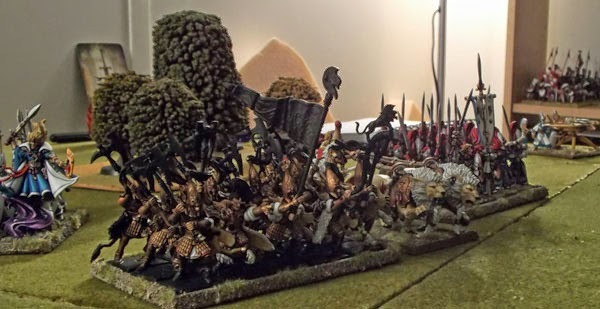 In the combat phase the proud hangunners finally broke and fled and the cannon was wiped out with the Elven horsemen overrunning into the flank of the militia. Bugger. 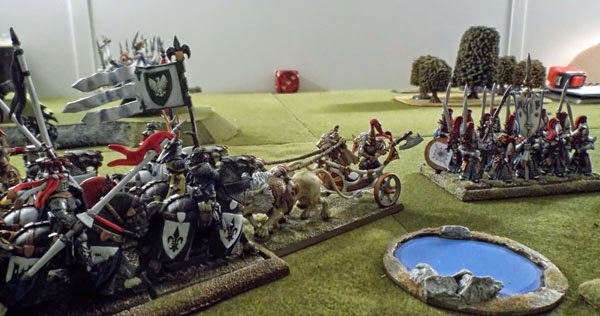 The Bretonnians went next and finally launched their cavalry into action, although heading for the chariot, rather than the White Lions, to my dismay. The Swordmasters were buffeted by magical twigs and branches, though shooting was once again wayward. 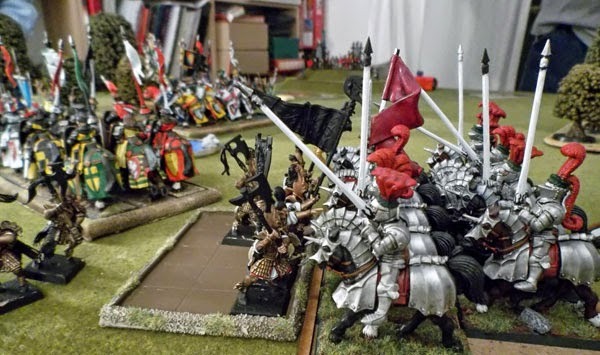 The knights duly smashed the chariot to kindling but were unable to ride on into the Swordmasters. I never saw them coming! In my turn I threw caution to the wind and charged into the White Lions, throwing down a card to give both knights and horses +1 strength. My wizard fled the spear unit to the safety of the woods but made no magical impression. 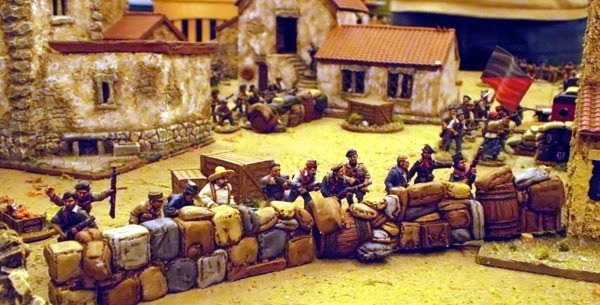 With my cannon and handgunners dead and my mortar still our of action we turned to fighting. Astonishingly the militia held against the horsemen and were able to reform to face them. Things went even better in the centre where the knights wiped out the White Lions to an elf and reformed to face the rest of the elf line. 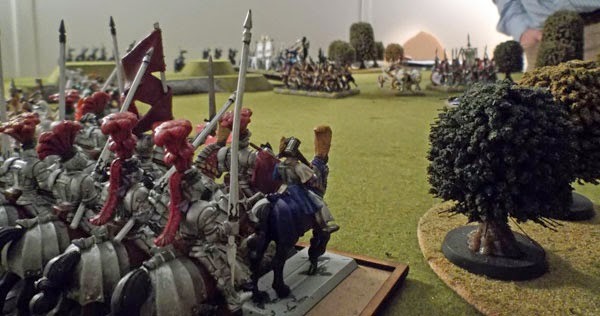 The elven spearmen, enraged by the deaths of the White Lions, launched themselves at the Knights whilst the reavers manoeuvred for a shot a the spearmen. 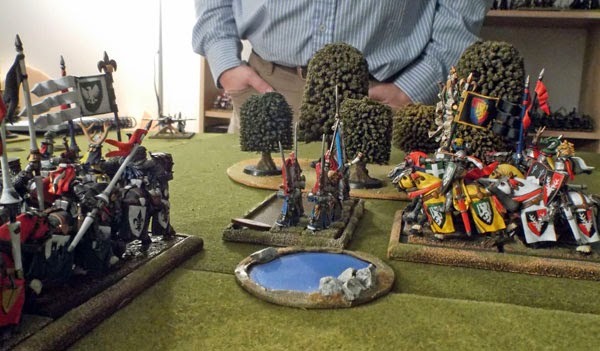 General Ballroom tried to cast magic to get his Swordmasters out of the Bretonnian sandwich, but I dispelled it. 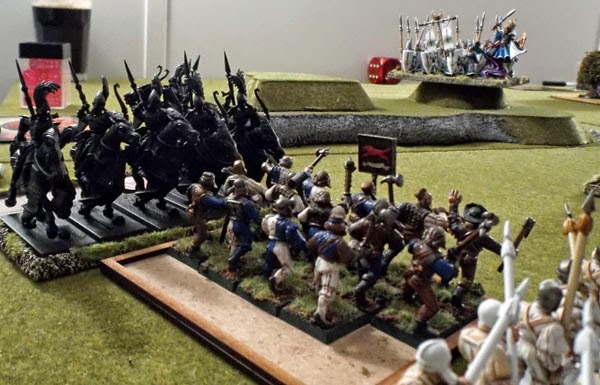 Shooting was limited so we went again to combat, where Abelard was able to inflict two wounds on Torvindal, the Elf General and Ikea shelving unit, and the knights dispatched a bunch of spear elves. 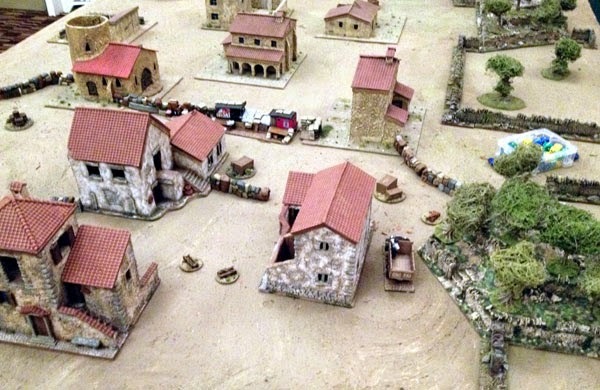 Unfortunately the militia were unable to repeat their feat of the previous round and were run down, with the reavers hitting the flank of the spear block. For the love of Sigmar, just die will you! With time drawing on we entered the final turn of the game. One more I went first. The fire wizard, discovering he was in a Blood Forest and realising he was facing a wizard with access to awakening in the woods wisely headed over to stand near the cannon, from whence he incinerated a pair of Elyrian reavers. 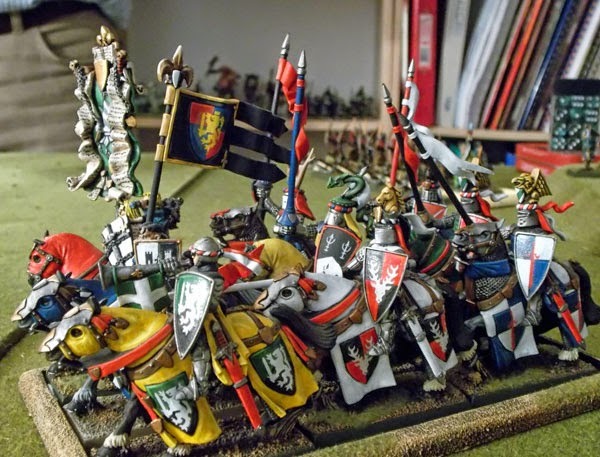 With most of my units engaged I fired the mortar at the surrounded Swordmasters, and wasn't exactly heartbroken when it scattered onto a unit of Bretonnian knights, killing one. 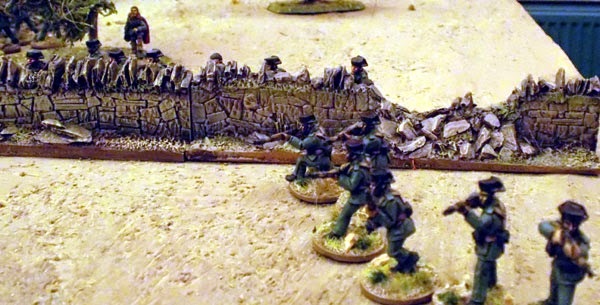 Both combats ground on and I was able to "flatpack" Torvindal with my general's hammer, but still the spearelves held. The perfidious Betonnians used a card to take away the ranks of my spearmen, but fortunately they were able to hold, though not reform. 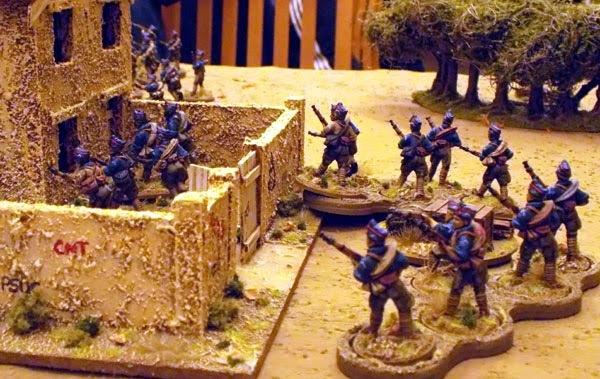 The final elf turn saw only fighting with almost all their units engaged. 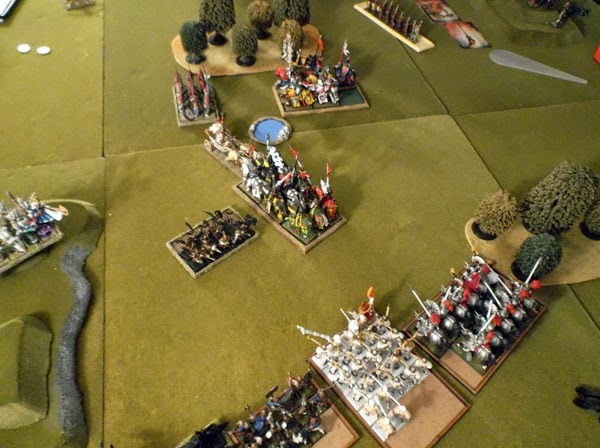 The reavers were unable to stand against the spearmen and fled the field, gifting me the magical Cloak of Ulric and my knights finally broke and ran down the spearmen. And so to the final round of the game. The Betonnians duly sandwiched the remaining Swordmasters and then softened them up further with a little magic. However in the shooting phase their fire was turned on me. I was able to sabotage the first trebuchet, but the second landed a huge lump of rock on my spearmen unit, causing them to panic and flee, dropping the Cloak of Ulric as they ran. Curses! The final round of combat saw the Swordmasters cut down, and with that the battle drew to a close. That was a hugely enjoyable game. Triumph and Tragedy is great fun,even if it does take a long time to play. I was lucky most turns with the order the cards fell in, so I ended up doing more charging than being charged. Stephen and I ganged on General Ballroom a bit, but then he does have a pretty powerful force. It turned out that I was the overall winner of the game, so I've gained a Sacred Grove. Stephen took a road from General Ballroom. 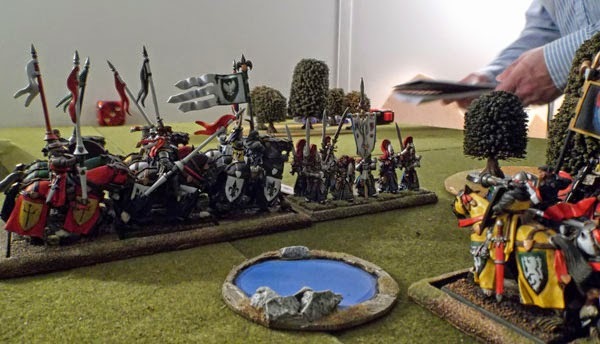 The Betonnians captured both their own Silver Mirror and the High Elf Moranion's Wayshard so they'll be able to use them in future games, although the Cloak of Ulric remains lost and soiled on the field of battle. 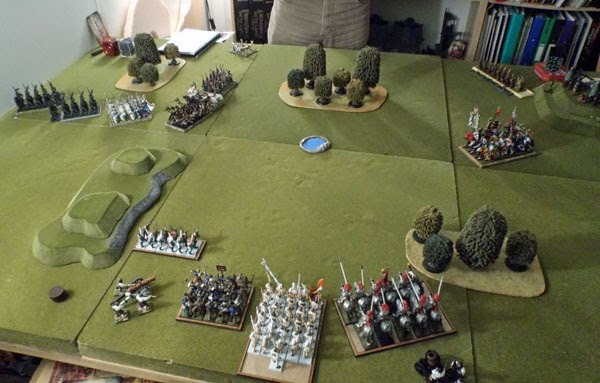 The plan is for me to return to the Gaming Hut next week to take on the High Elves solo. Ulp!